First, let me just get this out there. Content marketing is hard. To drive measurable results, it’s not whether or not it’s going to take time or effort, it’s a matter of how much time, effort, blood, sweat—and maybe a few tears—it will take. So why is content marketing such a tough nut to crack? I’d argue that it’s because a lot of people think content marketing is simply publishing a few blogs, then watching leads, traffic, and revenue come flying in. The reality is a little more complicated. From user intent to SEO, there’s a lot that affects what a piece of content becomes. Things that many, many people neglect. Sad. To really reach your business goals through content marketing, make sure you and your team are keeping these five things front-of-mind when crafting your strategy and plan of attack. Miss one and you’ll end up with just some words on a page and lackluster results. This is the most important part of any content marketing strategy. If you do nothing else, do this—know why you’re creating the content and how it relates to your company’s overarching goals. In other words, don’t be a mindless content robot. If you’re investing time and money into content creation, you’d better understand how it fits into your overall marketing strategy. There is no value in half-heartedly publishing content on your site just to check the box of marketing best practices. While I don’t necessarily advise a brand to ditch their blog or stop offering downloadable resources, I’d almost rather see no content than content that says nothing. I’d bet your users would, too. Let’s look at a few examples of how content aligns with larger biz goals. This may sound obvious, but sometimes the simplest solutions are right in front of your face. If your job is to drive leads, produce content that requires your users to share their information. Forms will become your best friend. And if you’re a B2B organization, invest more time in resources like webinars, ebooks, or white papers and less time on one-off blog posts. If the purpose of a piece of content is solely to bring organic traffic to your site, you’d better make sure you’ve done your homework. Even if you write the best piece of content for something like “the top 10 ways to peel a kiwi without a knife,” if only five people search that every month, at the very best you’re generating five new sessions. That said, highly searched keywords usually mean tough competition, so find a balance. One example of how you could alter your content marketing strategy to bump up organic traffic could be to focus more (not to be confused with all) effort on long-form content (over 1000 words), which tends to perform better in the SERPs than short form. This one’s a doozy because there are lots of ways to make money through content. Some low-hanging fruit, though, is to make sure your product and/or services pages are on point. That means they’re easy to understand, they cut down any friction, and they’re visually appealing. If your content’s goal is to assist with conversions, you might get that final push through something as simple as adding an FAQ section to a page or toying with how the page is laid out. Or making the button red. Or testing. Constantly. 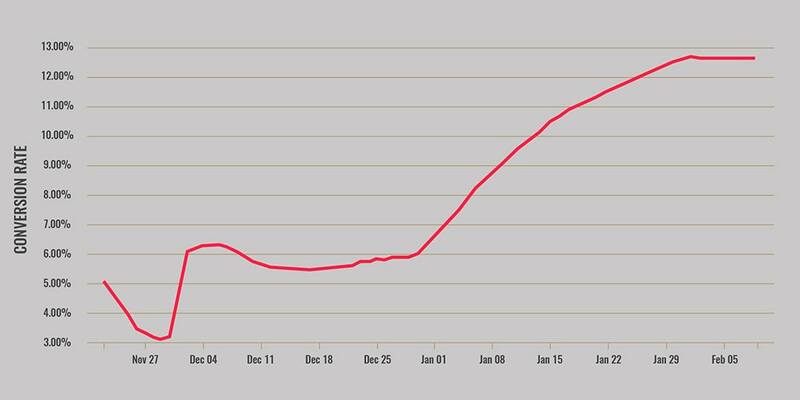 The chart above shows a landing page’s conversion rate over the course of a very successful campaign we ran last year for one of our clients. But it wasn’t always successful (at least not until we toyed with both landing page content and paid ad messaging and targeting). Little changes to your content can result in big wins. Don’t believe us? Check out the entire Gift of Adventure case study to see for yourself. 2. Who Are You Writing To? Every piece of content needs to be written with a certain type of person in mind. Yes, I’m talking about personas. And while marketing to personas is just the tip of the iceberg of what’s to come (AI, website personalization, etc. ), it’s still important. You likely have multiple personas you’re targeting, so your content needs to address the pain points of each persona. It all starts with documenting and educating those around you. At Element Three, we rely on team members to contribute content to our site. They’re smart people and, believe me, you’d rather have a developer like Zack writing about foundational website elements than, say, me, the content marketing specialist. Zack’s first inclination, though, might be to write his piece of content towards people like him—developers. But as a full-service marketing agency, we don’t want developers to read our content. It’s not that we have anything against them, they’re just not who we’re targeting. So instead, it’s about making sure that when subject matter experts provide content to your site, they’re doing so through the lens of the target audience. So you know your audience and you know how the content is fulfilling a specific marketing or business goal. Great! Now you need to think about the user. You might be thinking, “Isn’t that what writing to my audience is?” Glad you asked. User intent and target audiences are different. Writing to your target audience is more about tone—understanding their pain points, how they communicate, and what motivates them. Fulfilling their intent is about answering the question they have. Why are they visiting that specific page? What information are they looking for? What are they expecting to find? Answering questions about your service on your services page seems pretty obvious. But we’re not here to focus on the elementary, right? To take it a step further, you should be able to map search intent—and the keywords they’re using—to the buyer’s journey. Certain keywords can correlate to where your users are in the marketing funnel, so understanding how to use those search phrases to your advantage in the content you produce can create a great experience that pleases searchers and search engines alike. If you optimize a piece of content for a particular keyword, first figure out where that keyword fits in the marketing funnel. Is it awareness? Decision? Comparison? As you could imagine, awareness content and comparison content are going to be way different. And ultimately, grasping the difference and optimizing accordingly will dramatically affect if they stay or if they go. Just because a piece of content is meant to drive organic search traffic does not mean that it gets to be boring. A piece of content is well-researched, targets all the right keywords, and is helpful to your users? Great. Awesome. But make it feel like your brand. Unfortunately, there’s no metric that tells you whether the things you or your team produce are on-brand. My advice? Either ensure that whoever is responsible for the content and brand within your company has a strong set of brand guidelines, or ingrain it in your team’s brains that you will inject a piece of your brand in everything you publish. From product descriptions to privacy policies. Make it sound like you. In fact, I’d argue the most boring pieces of information on your site have the biggest potential to move your brand forward because users are expecting to be bored. FAQ section? Yawn. Until it’s not. And then BAM. You’ve won their attention. They might even tell a friend. 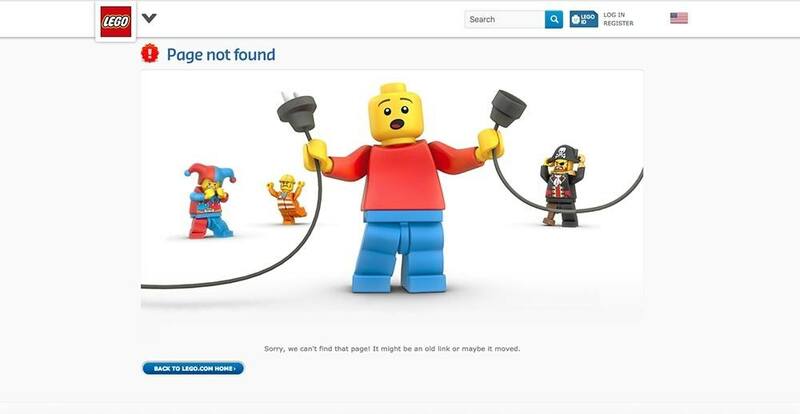 This is LEGO’s 404 page, proving that boring pages can still be fun. Whenever you or your team creates a new piece of content, know how users will actually get there. So far, I’ve talked a lot about keywords and organic traffic. So that’s definitely one route. But there are other ways, too. Paid Media, Email Marketing, and Referral Traffic, Oh My! First things first: you should probably plan to push each piece of content through multiple channels. That said, you can definitely publish a piece of content with a main channel in mind. 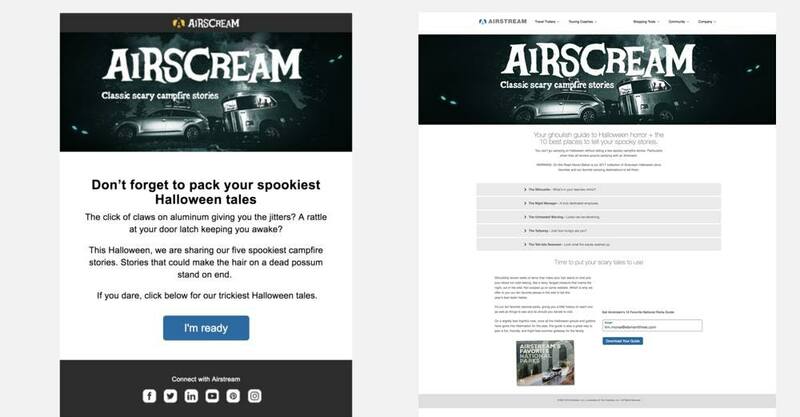 For example, if you’re creating a spooooooky version of your site for Halloween like Airstream did, it’s probably not going to get much search traffic. That’s okay, if you know that going into it. Instead, that brand-building piece of content might be promoted through paid media efforts, a promotional email send, a strategically placed CTA on the site homepage, and even an external link from a publisher you proactively pitched to. Because the branded landing page (shown on the right) won’t earn organic traffic on its own, we made sure to send a promotional email (shown on the left) to help get users to the page. You can also use CTAs across your site and utilize channels such as paid search and social to promote the content. If you’re publishing content and just hoping for the best, odds are your audience won’t find it. And you can’t afford that, especially if you got everything else right. At this point, you’ve created an amazing piece of strategic content that moves your brand forward and that users can find. But the content’s job isn’t complete when your audience finds and engages with the final piece. Instead, you need to think about where you want the user to go, or what you want them to do, once they reach the bottom of the page. Now, this will definitely relate to your content’s goal. For capturing leads, it may be pretty straightforward. You want them to fill out the form. But if your user finds that high-level awareness piece of content, what do they see at the bottom of the page? At the very least, you probably want to keep them on your site. So maybe you include other resources they might enjoy. Perhaps the content is part of a larger social media campaign, so you ask them to contribute user-generated content. Have they subscribed to the newsletter? Or possibly, you really don’t show them anything because you plan on running retargeting campaigns to get them back to your site. One way or the other, you have to have a goal for the audience after they read your content. Like we discussed earlier, you can’t just create content to have it. There has to be a purpose, a reason why you want someone reading your piece. And that purpose should be further action, not just a bunch of visits to a blog post or a subpage of your site. In the end, you just need to make sure you’ve thought it through. It’s not over until, you know, they do the next thing you want them to. So figure out what that is. If you have a good answer, then publish it. Move forward with the plan. If not, reconsider. But I promise, if you and your team can make sure to hit all the buckets listed above, you’re well on your way to making something that makes your users happy, moves the brand forward, and drives real results, too.